Located just west of the Great Salt Plains National Refuge which was never opened to settlement, Cherokee became the county seat of Alfalfa County after its sudden growth as one of the tent cities of the Cherokee Outlet Land Run of 1893. Cherokee continues to grow as a stopover for visitors to the national landmark. 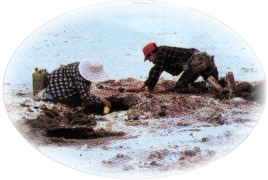 Annually beginning April 1st, prospectors come from all over the world to dig for the rare selenite crystals found only in the Great Salt Plains. Birdwatchers and wildlife enthusiasts find the refuge to be an ideal place for finding rare species in a collective environment. The Alfalfa County Museum in downtown Cherokee invites everyone to learn about the history of the area through exhibits displayed in the historic hotel. The Crystal Festival and Bird Celebration held the last weekend of April is a perfect time to see the very best of Cherokee as merchants, artists, photographers, crafters, and bird experts come together to create one of the most fun in learning opportunities in the state. The salt plains are a unique geological area. Visitors may enjoy viewing the near perfectly flat 11,000-acre barren area with the wafer thin salt crust or dig for the Famous Salt Plains selenite crystals with the hour-glass sand inclusion.